The image above essentially uses false coloring to show detail, but here is what it shows: a huge hurricane on Saturn that is 2,000 kilometers across. Researchers are also approximating that the hurricane's winds are getting a stormy 330mph. The image was taken by the Cassini spacecraft and released by NASA. While this is one powerful storm, researchers were amazed by how much the storm seems to look like one on Earth. 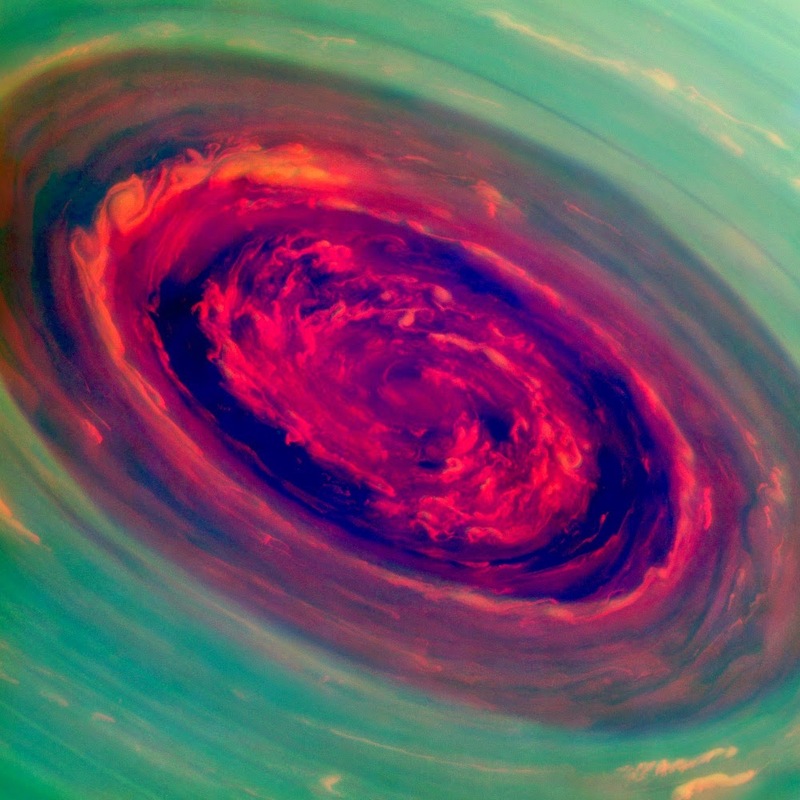 "We did a double take when we saw this vortex," said Andrew Ingersoll, a associate of the Cassini imaging group. This image is among the first sunny sights of Saturn's North Pole caught by Cassini's imaging cameras. The photos were taken with the Cassini spacecraft narrow-angle camera on Nov. 27, 2012, by means of a mixture of spectral filters sensitive to wavelengths of near-infrared light. The photos filtered at 890 nanometers are projected as blue. The photos filtered at 752 nanometers are visible as red and the photos filtered at 728 nanometers are visible as green. In this arrangement, red specifies low clouds and green specifies high ones. The sight was picked up at a distance of approximately 261,000 miles from Saturn and at a sun-Saturn-spacecraft angle of 94 degrees. Photo scale is 1 mile per pixel.